This tutorial talks about how to add Facebook photos in MS Word. 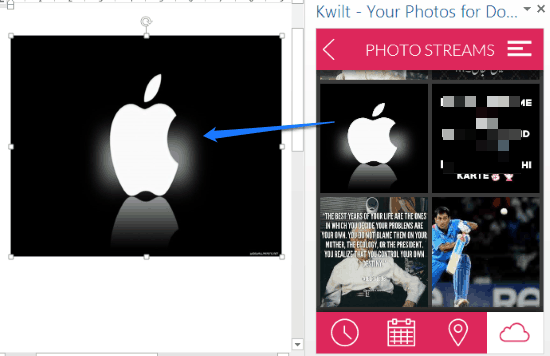 Using the Kwilt app in Word, you can easily add your photos from Facebook to any Word document. Not only Facebook, you can import photos from other sources as well, including Google Drive, Dropbox, Instagram, Twitter Photos, Google Photos and many others. 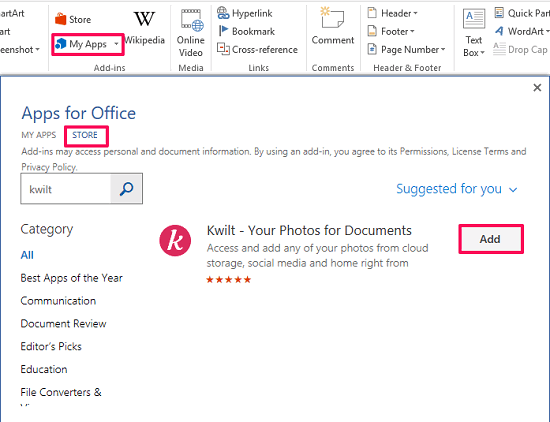 Using this Office app you can add Facebook photos in Word 2013 or above, PowerPoint 2013 or above, Word online and Office 365 also. Once you add this app, you will be able to browse all your Facebook photos from within Word and Powerpoint, and then directly add any photo to your document or slide. Kwilt is a free website that gathers all your photos from different sources. 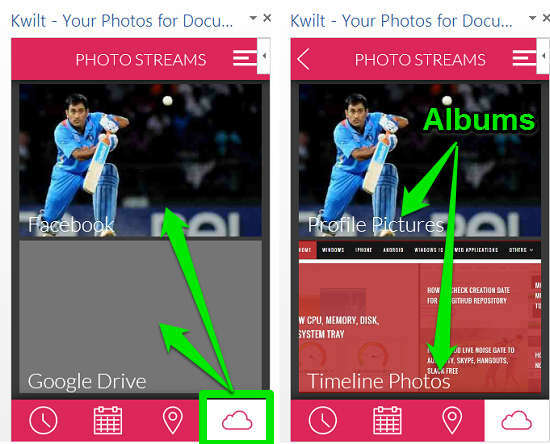 Using Kwilt you can aggregate your photos from various Social sites and cloud services. It can gather your photos from Facebook, Instagram, Google Photos, Twitter Photos, Dropbox, Google Drive, One Drive, and many others. And it is absolutely free to use. Sometimes you might want to add your photos from Facebook into your Word document or presentation. This is especially true if you are using Facebook specifically for storing photos that you can share with other team members, like, your company logo, company images, etc. In that case, normally you would have to go to Facebook, download the photo, and then add it to your document. This is where Kwilt Office app comes in handy. It lets you browse your photos of Facebook, and add them to your document, all from within Microsoft Word. Now let’s see how to add Facebook photos in MS Word. How To Add Facebook Photos in MS Word? 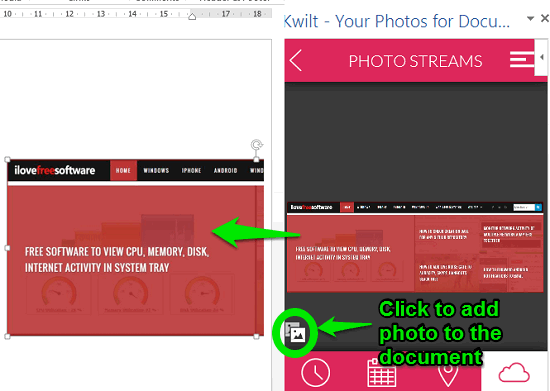 Using Kwilt App for office, you can easily add Facebook photos to your Word documents. To do this, just follow these simple steps. Step 1: Download and add Kwilt from this link, or you can also download it from Word. Just navigate to Insert >MyApps > Office Store. Search for this app there, and once you find it, click on Add. Step 2: Next step you need to do is login with your Kwilt account in this app. If you don’t have an account already, this app will give you option to create one. This app will then open browser for you where you can open Kwilt account for free. Then you need to add your Facebook account to Kwilt. To do this, click on Settings. Then a browser window will pop up. Choose Photo Streams option from it. Choose Facebook from the list and login into your Facebook account. After you grant permission to the Kwilt app, you will see that a Facebook tile will appear in the cloud section of the app. Step 3: Choose Facebook from Cloud section, and all your albums will appear there. Choose any one you like and locate your photo that you want to add in your Word document. Step 4: When you finally find the Facebook photo that you want to add in your Word document, simply click on the gallery icon from the bottom. After that, the photo will be inserted in your document immediately. So, in this way you can add your Facebook photos into any Word document in just a few clicks. I really like this Office app for its simplicity and what I like most is that you can also add photos from other popular social sites including Instagram, Twitter, etc. Kwilt is a really good app for Word if you often add images from Facebook, Twitter, etc. in your Word documents. I really like this app. The interface is well thought of, and using it is pretty intuitive. Give it a shot and let me know what you think.